Spring (and by association summer) is finally here and that means pretty makeup palettes, punchy lip colours, cool-as-pastel eyeshadows and flushed cheeks are fast edging out dark and vampy hues for prime position on the real estate map of our face. And thank God for that – because just imagine a deep and stormy brown lip or gothic black eyeshadow set against the blistering sun? Not a very appealing level of comfort, right? Instead, think garden-ready lavenders, baby blues, pop-py oranges and cool whites… doesn’t the world look that much prettier and softer with every little swipe? But (and it’s a big BUT) who can afford to completely overhaul their makeup bags to accommodate a whole new season’s worth of lipsticks and eyeshadows? Worry not. Keeping in mind form, function AND finances, I have whittled down the list to 11 of the season’s top makeup must-haves. These are the only products you need to be both cheerfully happy and completely on-trend through the coming months. I promise. Two shades of blue, the year’s all-important lilac, a rosy-pink, the essential nudes, graduated whites and a smudgy black gives this palette the right mix of absolutely any and every non-metallic eyeshadow you might need this season. Running short on time? Swipe on a gold eyeshadow and you are done. Seriously. And Stila’s innovative texture is versatile enough to cover the range from smokey to creamy to sheer in seconds, no makeup expertise required. You can even dip in a thin brush and use it as an eyeliner. Plus, it suits every single skin tone. End result: fool proof. Blue, blue and more blue. You simply can’t go wrong with a swipe of blue across the eyes this season. And this intense, vibrant cobalt blue covers all bases, right from morning to midnight. It’s super-pigmented AND waterproof for a highly metallic, sultry, inky intensity that lasts. And lasts. AND lasts. White, in all its crisp and beautiful simplicity, can be very dramatic. And cooling. Unfortunately, there are extremely few makeup brands that have been able to create a white eyeliner that’s both well pigmented (so you get true white in one swipe) and creamy enough not to tug the delicate skin. Obsessive Compulsive Cosmetics’ is definitely one of the best and worth every single penny. Pair with dewy skin, lots of mascara and a punchy lip. Orange – true, strong, in-your-face orange – is your new everyday lipstick colour. For real. You are going to be seeing it EVERYWHERE all through spring and summer. Unfortunately, it’s a pretty difficult colour to apply because the opaque hues mean you need to have a really deft hand to get a clean finish. Plus, it keeps coming off on everything… food, drinks, men… ! NARS’ Satin Lip Pencil solves both these problems with a creamy pencil tip that makes it super-easy to colour within the lines and then settles into a non-budgeable semi-matte finish that keeps going for hours. When you want a change from orange lips, turn to Dame – the perfect wine stain for summer lips. Although it looks seriously dark in the tube, on the lips it’s glossy, slick and sheer. Like you have been chewing on some really juicy berries – perfect for blazing afternoons and sultry nights. This sheer watermelon shade is perfect for creating a dewy glow that’s far fresher than plain ol’ pink. Bonus: I pat it on my lips to get a quick stain if I run short of lipstick. Spring means bronzed complexions – especially with this season’s just-back-from-the-Hamptons vibe – but not the shimmery versions that look fake and in-your-face. Guerlain’s Terracotta Light Sheer Bronzing Powders feel and look like second skin, with its unique combination of bronzing shades and fine pearlescent particles for a sheer and luminous glow. The sun-kissed-look needs some help to pull off and CoverGirl TruMatch’s balm-like consistency makes it both effortless and natural. Wear it alone, under or over makeup. It’s pastel enough to be sweet and spring-y, yet punchy enough to dress up the barest hands. You may just wear this nail polish all through spring and summer, on hands and toes. Neroli leaves, papaya flower, white amaryllis, white daffodil, white water lily, cashmeran and sand (yes, sand!) all packed up into a gorgeous bottle… need I say more? And that handbag? 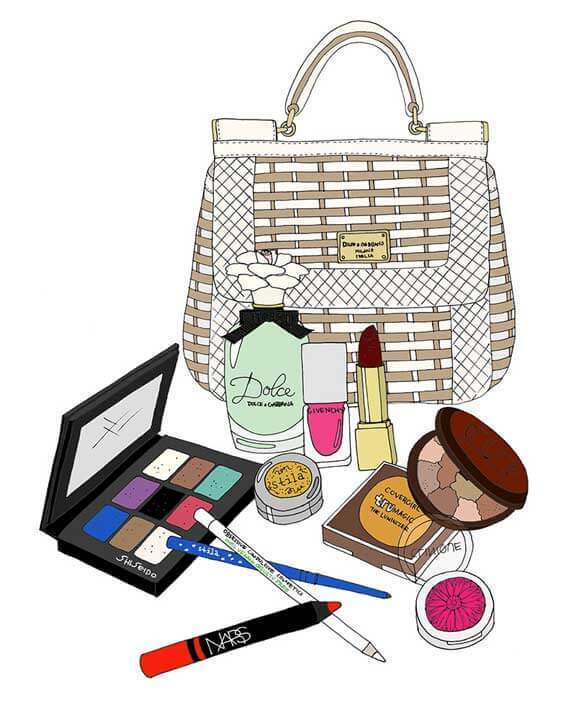 It’s Dolce & Gabbana Sicily Bag whose cane basket look is perfect for a summer on the Riviera. If I buy just one splurge-worthy item this year, it shall be this one! What’s on YOUR makeup wish list for spring and summer? « Move over, BB: Our skin NEEDS these new Asian beauty innovations! I seriously want every single one of these products, especially the Givenchy nail polish and the Stila Smudge Stick! Great picks! I’ve been looking for a new perfume to wear for the summer, thanks for your recommendation I’m going to try it!